This year a new item of Parshada making competition was added to this day, which was well received by the girls as well as the boys. Though 16 through 20 years competition was won by the girls but 0-15 was won by the boys. Riverside gurdwara Jatha won the first place in group kirtan and Akhand kirtan jatha won the first place in younger category. Riverside Gurdwara honored four students who will be going to college in 2012, and gave $500 each scholarship to them. Two more scholarships were also given to two students who are already in collage. End of the day All participants participate in Sikh quiz in four teams. The quiz was based on Life and teachings of shiri Guru Arjan Dev ji. It was great pleasure to watch these kids who are born and brought up in this country and learn the Punjabi language, Bani, kirtan and other activities in their free time. There is no doubt that more children and adults will be inspired by them and Riverside Gurdwara will have more participants next year. 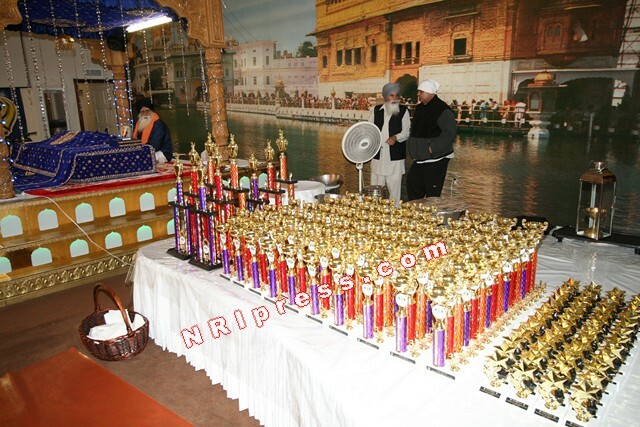 Mrs Navkiran Kaur Khalra was the chief guest and handed out the trophies to all participants and the winners. She is the daughter of Sardar Jaswant Singh Khalra, a Human rights activist from Punjab who was abducted, tortured, and murdered in 1995 by the Punjab police. In 2007, the Punjab & Haryana High Court upheld five convictions, enhancing all sentences to life imprisonment. Jaswant Singh Khalra's grandfather Harnam Singh was an activist in the Ghadar movement for the independence of India. This was a great effort from Rriverside Gurdwara. And it could not have accomplished without Parents, volunteers and sponsors, who worked so hard to put this program together.